Run application as different user to start program as administrator from a limited account like the command runas, but without to enter login information on each start. Run application under another account without entering the password is possible with the runas password utility RunAsSpc. or the graphical interface RunAsSpcAdmin. via an encrypted file from which the application run with administrator privileges. Users often work under administrator account, because a program need administrator rights to run. By using RunAsSpc, a limited user need no longer login as administrator to run these application. Run internet browser as administrator makes the system vulnerable to viruses, hacker attacks and other security risks. Surfing with a limited account decreases the risk. Use RunAsSpc and start the internet browser with a limited user account. without give him the admin account login information. Send him an encrypted file with that job. because you have to do some jobs with another account. Maybe you represent your college for a while or you need other rights for a while inside the application for some tasks. Run as administrator is not working. Your application, script, or batch file probably don't request elevated privileges on an UAC activated system. If an application request elevated privileges, then RunAsSpc start it with elevated privileges. A non-elevated application, can run with administrator rights by using my tool RunElevated combined with RunAsSpc, or simply using our advanced tool RunasRob. Bypass the UAC Dialog is possible with RunasRob. - Set the complete path of the application in the encrypted file. - The application must be reached for the user who calls the application over RunAsSpc, because RunAsSpc read the checksum of the application before the application will be call under another user context. UNC Path are supported. Mapped drives not. The encrypted file can be store on a mapped drive but not the application. RunAsSpc, cryptfile and the application can be store on different folders. Restriction in version for private use is the startup window with license information, which appears at random intervals. Authorize only a specific user or group to run a an application. This can be achieved by setting NTFS permissions to the encrypted file, the program file or program folder. Processes start from the allowed running application inherits the permissions. This makes sense, but not in all cases. 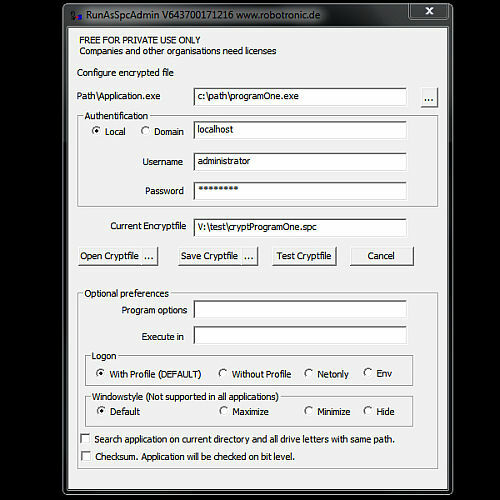 For example, if this application has a file open dialog to run other programs, a selected program launched from this dialog, run with same privileges. - Change the password after the usage. - Use only accounts with local rights. - Use RunAsRob, the part RunAsAdmin don’t need to store credentials to start application with administrator rights. Algorithm AES 256 bit is used for encrypted file. No data are transferred hidden over the internet and no adware or spyware are used. RunAsSpc is only free for private use.